I'm officially a fan of the paper-bag waist-style shorts! After buying several pairs, including these red and white striped pair from H&M, I can't imagine wearing any other style for summer! While that might be a bit of an over-exaggeration, I'm definitely smitten with this style of shorts! I hope these types of shorts will stay around for years to come, as it seems like it's a classic. If not, however, none of the pairs I purchased were all that expensive. In fact, there are many affordable options in this style, some of which I'm showcasing below. I decided to pair my paper-bag waist-style shorts with my "California" collector's tee. Since I live in California, this tee was a must have for my growing statement tee collection. Whenever I wear this tee, I always pair it with my watermelon bag, not because watermelons are quintessentially Californian but because the tee has a random watermelon on it! (I'm not sure why.) 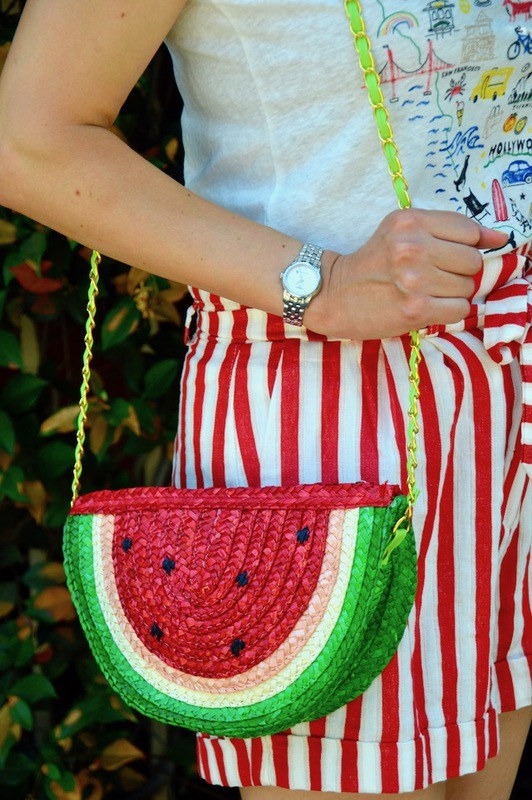 Plus, the watermelon looks great with red and white stripes, so it was the natural choice for this look. The striped shorts in red look so cute with this outfit. I had a t shirt similar to this when I grew up in Pittsburgh. It was a tee with all of the Pittsburghese people say. Wish I stil had it! Love the bag, so cute and summery!